At the brunch in December I introduced my friends to shakshuka, which they all loved. It’s such a great brunch dish if there is several of you as you can make the tomato sauce ahead and then cooked the eggs in the oven. If I make a smaller portion for lunch or dinner I cook it in a frying pan on the hob and cover the pan with a lid, as it’s quicker than heating up the oven. My version of shakshuka has the usual base of peppers, onions and tomatoes as well as tinned tomatoes to make it saucy. After baking the eggs in the oven I add the toppings; Greek yoghurt, crumbled feta and chilli flakes. If I made this just for myself I would have added some Tabasco as well, but here I left it on the side so everyone could help themselves if they wanted more of a kick. Bacon isn’t really necessary with this egg dish, but it works so well at brunch (and with the mushroom omelette) I thought it was a nice addition. Pour a little oil in a large frying pan or saucepan. Fry the garlic and onions until golden (not brown). Remove from the pan. Fry the peppers until soft and add the fresh tomatoes. Add the garlic and onions and stir on medium heat until nice and soft. Add the tinned tomatoes and water and stir occasionally. Season to taste with plenty of salt, black pepper and sugar if needed. Let the mixture thicken. If using a frying pan, make six “holes” in the mixture and crack an egg in each. Cover with a lid and cook until the whites are set. If using an oven, transfer the tomato mixture to an oven-proof dish and pre-heat the oven to 180C. Make “holes” in the tomato mixture and crack an egg in each hole. Bake until the whites are set. In the meantime, mix yoghurt with salt, pepper, lemon juice to taste and olive oil. When the eggs are cooked, remove from the hob or oven and add dollops of yoghurt to the pan/dish. Sprinkle with crumbled feta and chilli flakes. Serve with some nice bread. This is my attempt to recreate one of those amazing food memories I have stored in my head. My friend Caroline and I were in Bologna last year and although we couldn’t secure a reservation at Osteria Franscescana in nearby Modena, we still decided to visit for the day. We went to Massimo Bottura’s much more unassuming restaurant Franceschetta 58 for lunch and tucked into the small but perfectly assembled lunch buffet. And that’s where I had one of the best pasta dishes I’ve ever eaten; their orrechiette with salsiccia. It was utterly heavenly and what I tried to create at home one day, with my last precious salsiccia from the same trip (stored in the freezer of course). I must add that the very authentic salsiccia help make my version of the dish very good, so go to a good Italian shop to buy those. Without proper salsiccia you needn’t bother with this dish at all. Heat up the oil in a casserole dish. Remove the skin from the sausages and fry in the oil until golden brown. Remove the sausage meat from the casserole dish and add the soffritto and garlic. Fru on medium heat for a minute or two. Add tomatoes, water, tomato puré and wine. When the sauce has thickened a little, add the sausage meat and fennel seeds. Let the sauce reduce further. Season to taste with salt, pepper and some sugar (to balance the acidity) if needed. Mix into the drained orrechiette and serve with finely grated parmesan. It may seem a strange pizza topping, but I assure you it’s not. Most pizzerias in Sweden offer this and it’s probably the best hangover cure in the world, right up there with a kebab pizza. Yes, that’s also a thing in Sweden! You see, most pizzeras in Sweden are not authentic Italian ones but conveniently located in small towns, even villages and the go-to place for a takeaway. The menu is often eclectic and most have one called ‘pizzeria name’ + special, which is their take on the beef and bearnaise sauce pizza. It’s rarely you get nice beef though, it’s more similar to kebab meat but it’s still nice. Since bearnaise sauce on pizza is not a thing in the UK (sob), I made my own the other day. With proper rare fillet of beef. It was so delicious and I can’t wait to have it again. Because although the Swedish pizza with beef and bearnaise sauce have a special place in my heart and something I have to have at least once a year when I go home, this was SO much better. I was tempted to make my own bearnaise sauce to put on the pizza, but was afraid it might split on the hot pizza base so I decided to play it safe and use a store bought, more stable version. Make the dough. When it’s raising, make the tomato sauce: Fry the garlic in the olive oil in a non-stick saucepan. Add the chopped tomatoes, some water and the tomato paste. Cook for 15 minutes while stirring occasionally, until it has thickened. Season to taste and put aside. Once the dough has risen, roll out a pizza. Spread with tomato sauce and distribute torn chunks of mozzarella on the pizza. Add the mushrooms and sprinkle with orgeano. Bake in 225C oven for approx 10 minutes until cooked through. Season the beef and fry it in butter while the pizza is in the oven. It only needs 1-2 minutes per side. Let the meat rest for a few minutes, then slice it thinly. Remove the pizza from the oven. Add the beef and bearnaise sauce. Serve immediately! 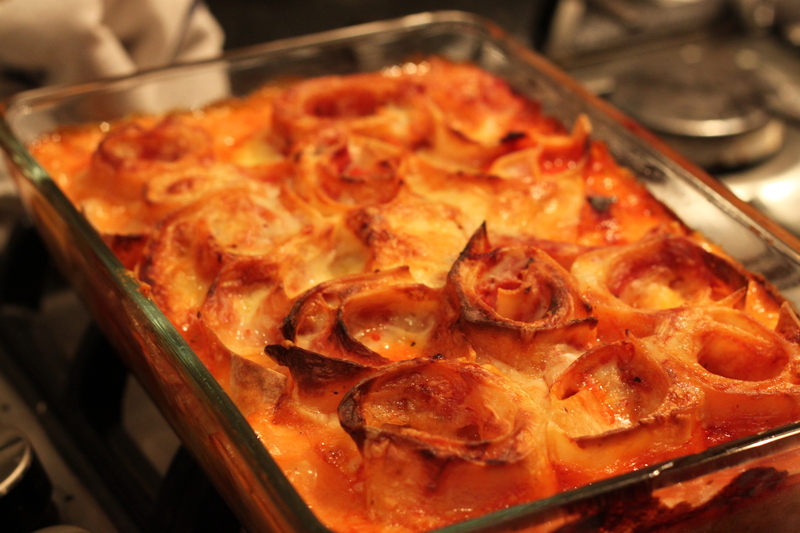 I spied this new (for me) type of pasta bake on a Swedish food blog. You take fresh lasagne sheets, add cheese and ham (and possibly courgette as well, which I forgot), roll them up, cut them in half and place them in a gratin dish. Add tomato sauce, bechamel and grated cheese. Really nice and more upscale than your regular pasta bake. And it is great to serve with bread to soak up the sauce. Place about 3 slices of cheese on each lasagne sheet. Divide the ham between the sheets and put it on top of the cheese. Roll them up from the shortest side. Place the rolls on a flat surface, i.e. a chopping board or plate with a weight on top so the rolls will keep their shape. Add all the ingredients for the tomato sauce into a sauce pan. Bring to the boil and let it thicken while stirring, for 15 minutes. Melt the butter for the bechamel in a non stick pan. Add the flour while whisking. Add some of the milk and stir with a whisk. Once the sauce has thickened a little add more milk and repeat this until you have used up all the milk and the sauce is thick. Add the cheese and let it melt. Season to taste with stock concentrate, nutmeg, salt and pepper. Grease a gratin dish (10x20cm). Cut the lasagne sheet rolls in half and place them with the cut upwards. Pour over the tomato sauce, followed by the bechamel. Sprinkle grated cheese on top and bake in 200C for 15-20 minutes. Serve with bread/garlic bread and a nice salad.